처음 드림의 오피스에 모여 함께 첫시간으로 예배할 때의 긴장과 걱정, 설렘이 뒤섞인 모호한 마음이 기억난다. 그리고 오늘 마지막 날을 준비하면서도 그 모호한 마음이 다시 마음 위로 떠올랐다. 드림을 시작할 때는 앞을 알 수 없는 마음에서의 모호함이었다면, 드림을 마치는 오늘은 너무나도 빠르게 흘러간 6주의 시간에 대한 아쉬움과 앞으로의 드림을 생각하는 나의 마음이 섞인 모호함 인 것 같다. 드림에서 한 주, 한 주 일을 하면서 가장 놀라웠던 것은 드림이 중점을 두는 가치가 일의 성과에 있지 않음에도 불구하고 일의 성과가 가장 아름답게 매번 나타났다는 점이었다. 짧은 스케줄에 맞춰 바쁘게 일을 하면서도 매시간 일을 맡은 구성원들의 마음에 기쁨과 평안이 함께 할 수 있었던 것은 드림이 목표하는 “Walk humbly with your God”이 우리 모두의 마음속에 기억됐기 때문이다. 매일 매일, 모든 구성원이 서로와 드림을 위해 기도하면서 말씀으로 아침을 열고 그 날 함께 걸어가신 하나님을 기억하면서 하루를 마무리 했다. 이렇게 매일매일이 흘러갈 수 있었던 건, 그 누구의 신앙과 마음이 특별히 훌륭해서라기보다 나의 부족한 신앙을 다른 누군가의 기도가 채워줬기에 가능했다. 우리의 삶은 너무 바쁘다. 바쁠수록 혼자서 하는 것, 혼자서 걸어가는 것이 너무나 당연하고 편하다. 그러나 삶에서 누군가가 혼자 걸어 갈 때가 아니라 하나님과 그리고 동료들과 함께 걸어갈 때, 진정으로 우리가 추구하는 결과가 이루어진다는 것을 다시 한번 드림을 통해 기억할 수 있게 되었다. 그래서 드림이 너무나도 소중하고 감사하다. 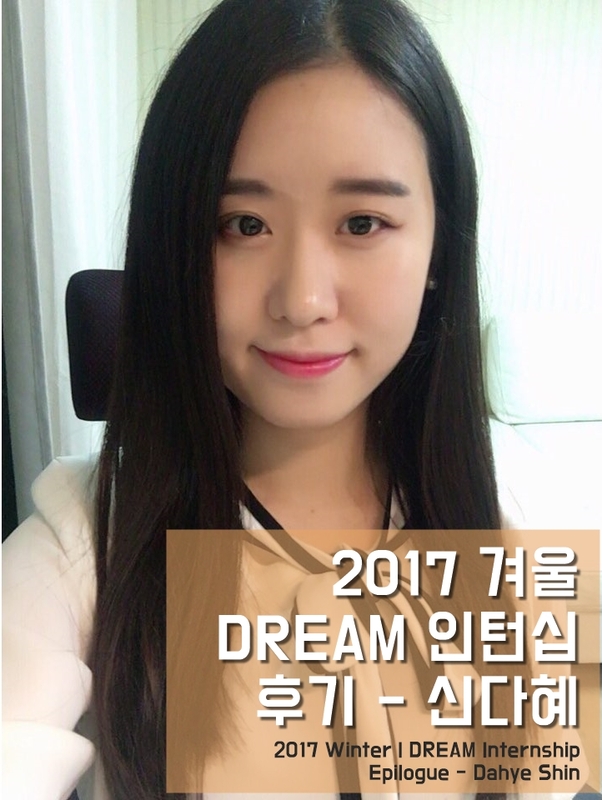 I still remember the first gathering of DREAM’s 2017 winter internship. We started a day with an opening service. I felt ambiguous feeling as usual starts entailed, and it was mixed with the awkwardness, anxiety and excitement. And today, preparing for the last day of DREAM, similar ambiguous feeling rise to the surface. The feelings that I had at the beginning of the internship was because of the uncertainty of a new start, but the feelings that I have today at the end of the internship is because of regret and sadness originated from the fastest six weeks that I had with DREAM. A marvelous thing that I realized while I was working at DREAM, was that even though DREAM’s first value was not on results, every time, we met ourselves with wonderful results, more than we expected. Although sometimes we had to work hastily and squeeze our schedules within a short period, our team members’ minds were fulfilled with joy and peace. This unbelievable delightful time was possible because we root our foundation on Micah 6:8, especially on this part, “Walk humbly with your God”. We tried to remember this verse every day when we started our day with morning service. We also tried to remember this verse every night, when we closed our day with evening service. Our endeavors to fill up each member’s faults and errors by praying for each other eventually allowed us to finish all the projects. Our lives are too busy. When we get busy, we tend to forget others and to stick to the plan of working alone; because it’s easier. But in the deep side of our minds, we already knew that it is more beautiful to walk slowly with others than just to walk alone to go faster. Thanks again to DREAM for letting me turn my head again to see this wonderful fact about life.